The reason for the and/or is because, glue gunning is definitely the quickest way to finish this item, but if you consider glue-gunning instead of sewing to be cheating, well then you just go right ahead and sew your little heart out instead. 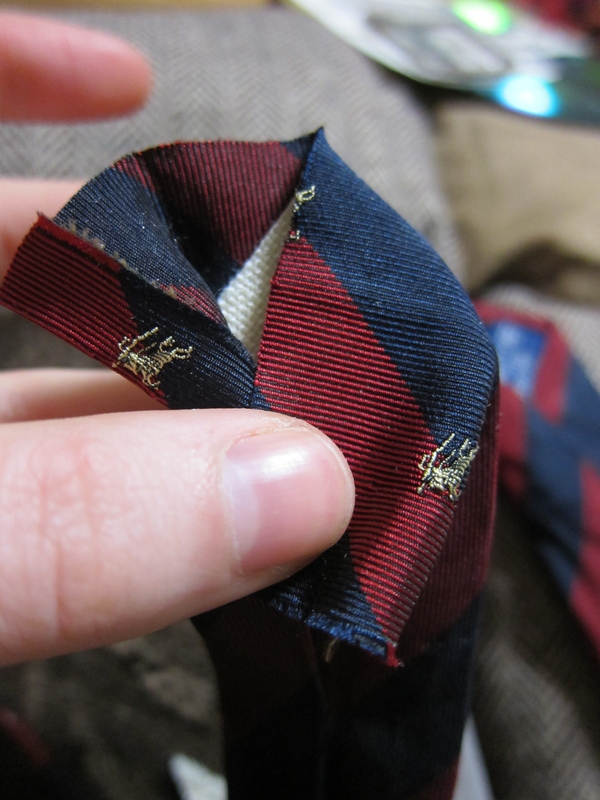 Next, if you have purchased your used neck-tie from a second hand store, be sure to put it through the wash once before starting your craft, BUT beware, check the type of material you are washing and don`t throw a silk scarf in your washing mashine because it will not look the same when it is finished in there. Actually, after my own personal experience, I would recommend washing by hand. I had never washed a tie before this, so I didn`t know any better, but there is this little piece of course fabric inside the tie that gets all mangled and mushed up inside the tie from a regular washing mashine cycle. I am just going to say it, DO NOT put the tie in your washing mashine. Moving on, Now that your tie is all clean and fresh-like, you need to begin the carnage. You need to cut it. This is sometimes the hardest part, because once it is cut there is no turning back. I measured the tie around my head with half the circumference being overlapped (or less if you are feeling risky). Cut the narrow end, not the wide end. 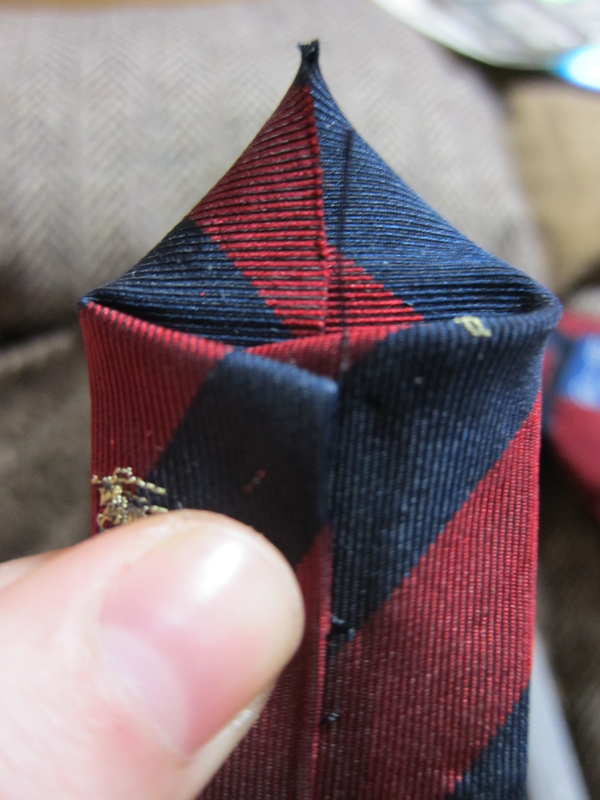 Then you will need to either glue gun or sew that end of the tie into a nice neat end. 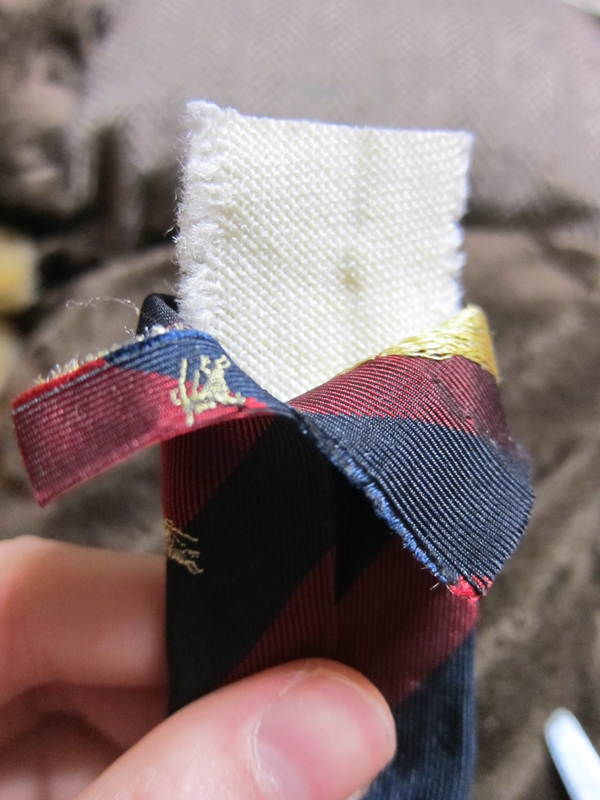 You can tuck the cut part inside of the tie (about 5/8 inch for all you sewers out there) and then sew or glue it in there. Look! Step by step with pictures! sew or glue that sucker up! 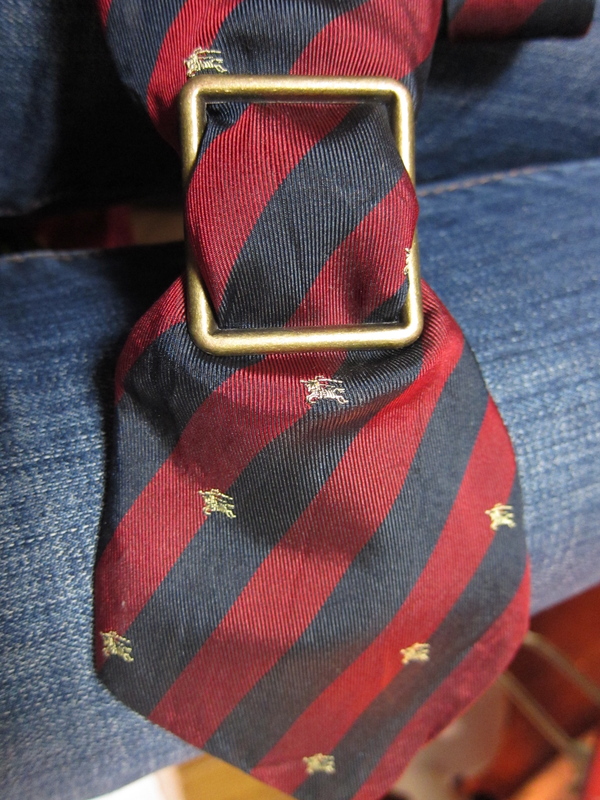 Next, take the slide adjuster and slip it onto the wide end of the tie. The middle bar of the adjuster should show on the `wrong` side of the tie (the side you don`t see with a crease down the middle). 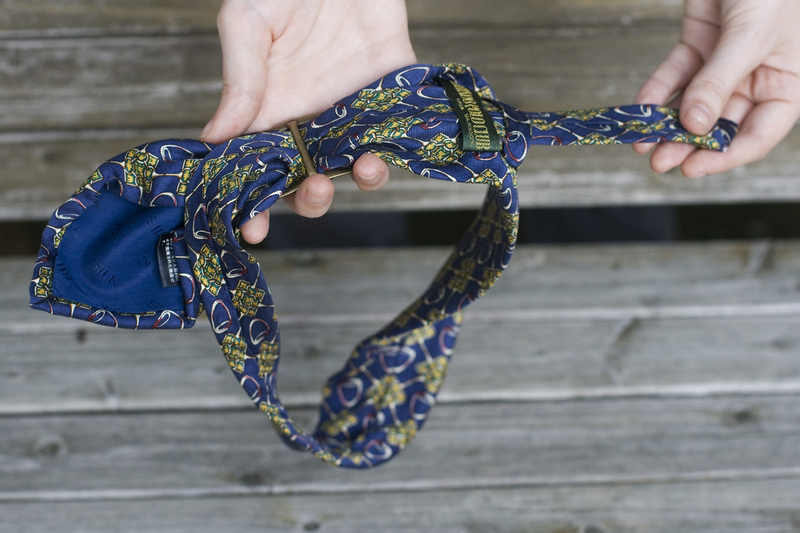 As much as you would like a flap of the tie to hang from the headband, push the slide adjuster up the neck-tie. I would say about 10-15 cms from the end. 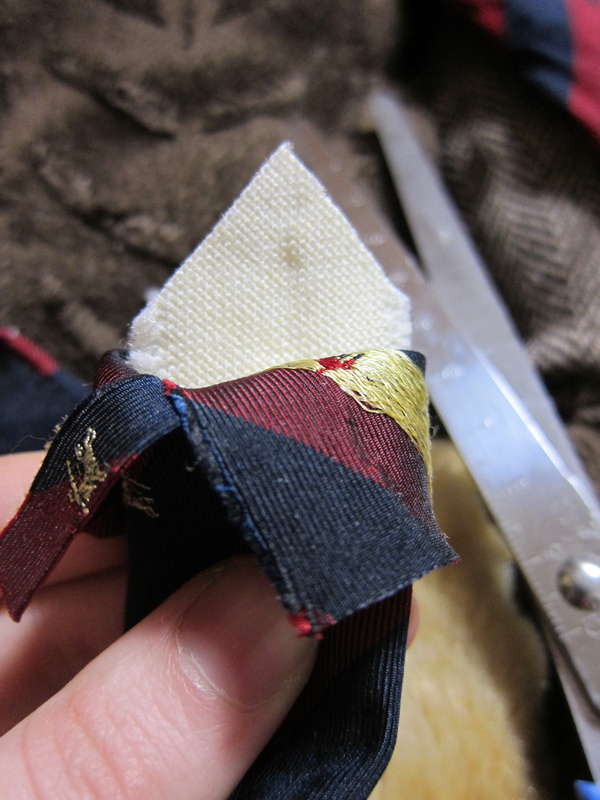 Depends on your taste and ofcourse, you can do adjustments later if you want, you will not glue/sew it in place. The tricky part, and the only tricky part. I found that the headband flap was somewhat unruly and didn`t always go where I wanted so I put a piece of wire into the wide end of the tie in a kind of triangle shape along the the three points. I found this wire at a Japanese craft store where they showed pictures of the wire being used in silk scarfs to make headbands (pictures are sometimes all I have to go off of in this country). Before putting the wire in, bend in the end at about one cm, to give it a blunt edge, not a poky wire that may come out of the headband and jab you or a nearby stranger (just in case). Flip the tie over so you are looking at the `wrong` side. In order to get the wire into the wide end of the tie, you will need to use your scissors one more time. There will be stitches keeping the tie end closed, so you need to cut a few stitches to give you enough room to slide the wire in (only about 1-2 cm). You will not be able to see this part, so you will need to feel where the wire is. Push the wire into the tie and get the middle of it to go to the longest point of the end of the tie. 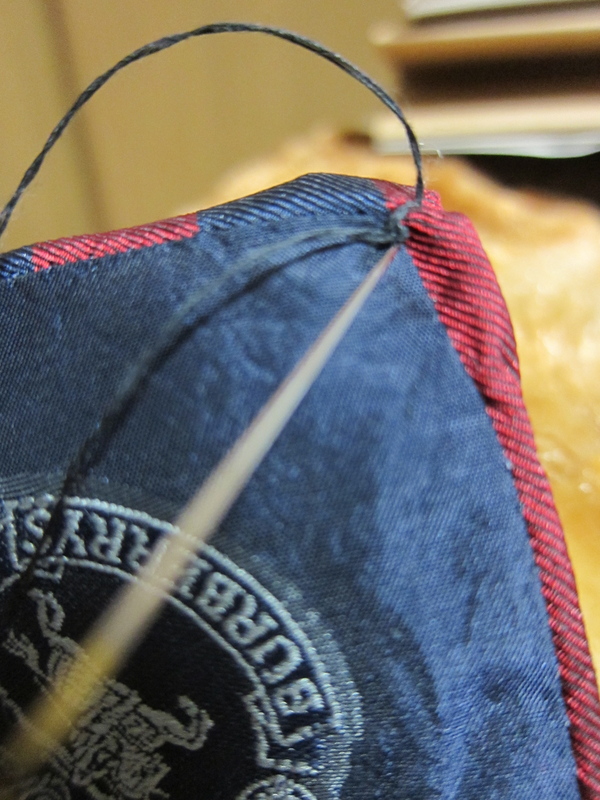 For extra security, I then sewed the wire in place doing a simple whip stitch that wrapped around the wire and anchored in the `wrong` side of the tie end. I then moved one half of the wire so it followed the edge of the tie and anchored it in the same way to the left corner and then did the same with the right corner. If the ends of the wire are still floating around inside, just point them towards the slide adjuster. My wire reached all the way to the slide, so it could kind of `tuck` into the slide. If you are thinking, this lady is psycho if she thinks I can follow these instructions, please, feel free to check out a little youtube video I posted showing how to get the wire to work for you. Hope it helps! Phew! Did you make it?! Well, just one more step and you are done. Take the thin end of the neck-tie and thread it under the large end of the neck tie through the slide adjuster in the opposite direction as the wide end. This will create a loop. 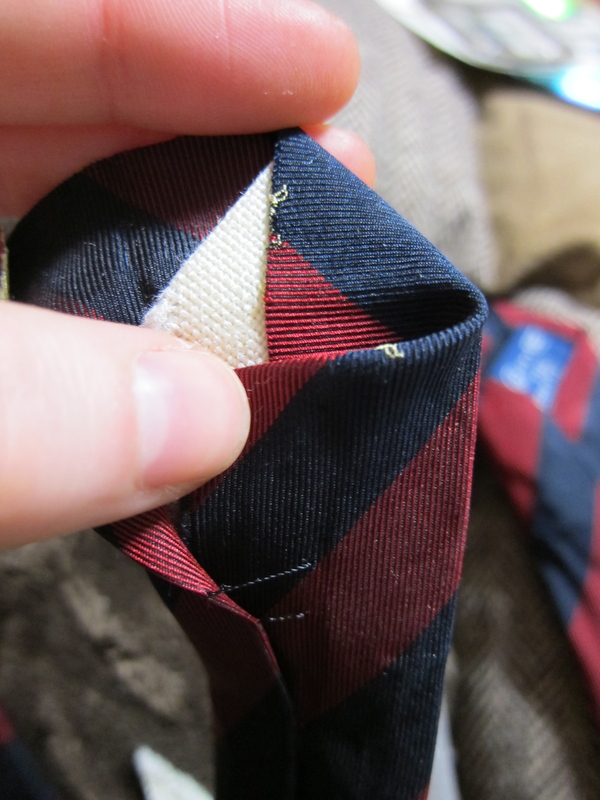 To adjust the loop size to fit your head, just pull the narrow end of the tie and it will tighten. 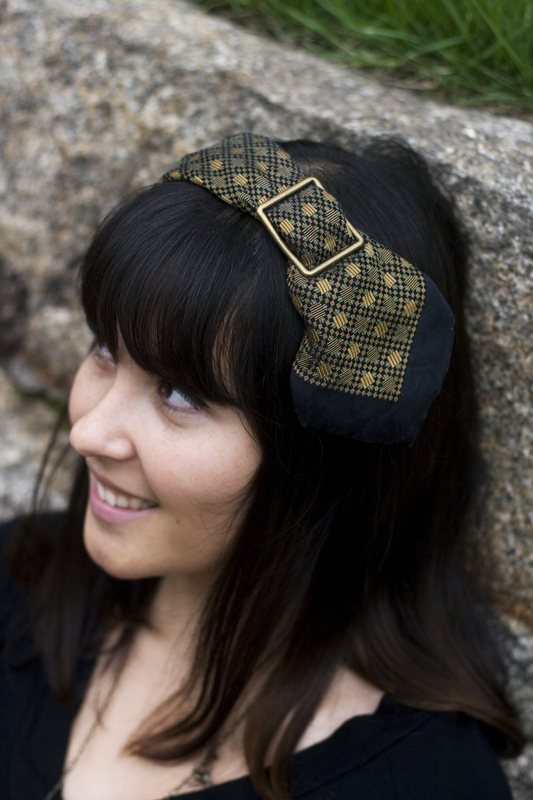 Now you have a new headband! If you have any questions, or comments, please do not hesitate to let me know. Though I tried to be clear, I understand that having someone there in person is always the best way to learn these kinds of things. And, since this is my first time writing out a DIY, I am sure there are things I have overlooked. Good luck! So fun! I wanna try it! Good job on your first DIY post! It was so easy to understand!!! Great job, Cori-chan! Like Hirari said, this is super clear and very easy to follow! Oh, so pretty! Thanks for the idea + tutorial! 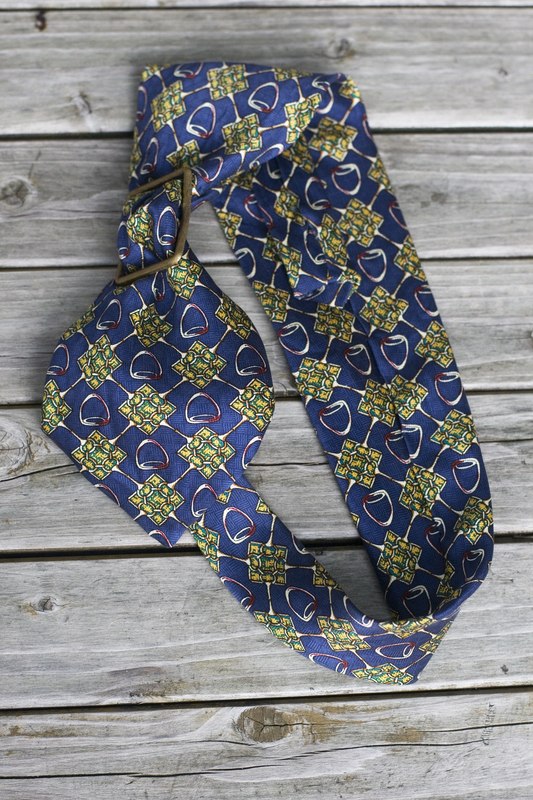 There are so many lovely ties out there that needs a new home. I’ll look for some with this idea in mind! How is this to wear? Is it hard to tighten, or does it loosen during the day? It seems like sewing everything in place would be easier than having it adjustable. Very pretty though, I will have to be on the lookout for ties to thrift. The headband is quite comfortable. Though it can loosen a little during the day, it is easy enough to cinch it tight again. Sewing it in place would make the upkeep easier, but then you would need to put an elastic into it or something so you could take it off and on. Good luck with your thrifting!! Have been looking for simple, good idea to use the gorgeous 1940s ties I see on ebay all the time….don’t want to destroy them; want to use ’em in 1940s dress-up. Your idea is the first I’ve seen that can preserve and highlight the beautiful tips of these ties. Love it!!! I am glad you like it! 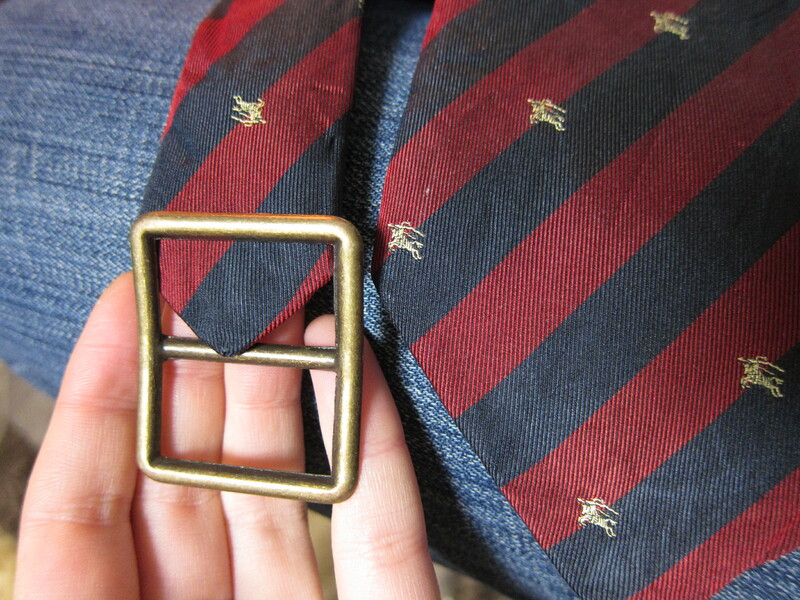 Ties are constructed well and the materials tend to be so beautiful. Best to just highlight them when repurposing 🙂 Thanks so much for your comment! Hello! I add a link to this page. Take a look here. http://donneinpink.blogspot.it/2014/03/come-riciclare-le-vecchie-cravatte.html I hope you appreciate this!